You might not notice it, but we had the opportunity to take these photos quickly after my daughter's birthday party on Saturday. It was 0 degrees and I was literally shaking. Luckily we were able to get photos without taking too much time. I just got this sweater from Zaful and it arrived late last week. Paired with my new statement necklace which looks much pricier than its $5 price tag, it was perfect for running around during my daughter's birthday party. Warm, but not too warm and definitely cozy. I just wish it was a few inches longer! Then it would be a great top to wear with leggings, too. Such a beautiful poncho sweater and I love the fringe details. Lets not forget about that amazing statement necklace to add a little extra bling! Laura, this sweater is adorable! I have a similar one in black that I absolutely love. And that necklace is amazing, too! (Wal-Mart has really pretty ones like that in the $5-15 price range and I want them all!) By the way, I am loving your hair in these photos, too! What a darling sweater. I have a grey one with fringe but oh the swing of this and the color....I swoon!! In love with this fringed turtleneck sweater! The color is so pretty and the necklace adds the perfect amount of sparkle. You have inspired me to try a look like this. Happy New Year! This is such a great fringed sweater, super cute outfit! What a gorgeous poncho sweater! Love the fringe detail! Such a cute look! pretty sweater! love the color. i always say this--idk how you northern bloggers do it!! Wow! You must have been sooooo cold when you took the photos! I really like the sweater. The necklace looks great with it! Trying to take outfit photos in these freezing temps is so tough! I'm glad you braved it for this shot! Love the color on you! Well, great job girlie because you can't even tell you were cold! I always love your hair like this too! Lucky that you have such nice curly hair! It is rough taking outside photos sometimes!! But you totally can't tell it was freezing! At least we don't have to model bathing suits in the snow, right? And I love this necklace to spruce up a solid colored top!! How fun are the fringe details on that sweater! And you are one tough cookie to take photos outdoors in 0 degree weather! How is that necklace $5?! That is awesome, perfect outfit for a 1st birthday party. And 0 degrees...yikes! Love this outfit! Beautiful color combo. I want that sweater to wrap up in! It looks so cozy! And your curls look phenomenal in these pictures! I like that color on you. what a gorgeous look. I love the sweater and the way you styled everything. That necklace really stands out to me, it is so gorgeous! I really love this tunic, too with the tassel edge. I too prefer tops to be long enough to wear with leggings, but sometimes it is hard to know when you purchase it online! It has been FREEZING here, too, but we're supposed to get a few days of 60 (gasp!) degrees weather! Love the save and splurge option for each item. Thanks for sharing! This statement necklace is such a stunner! Such a fun sweater. I find Zaful clothes to run short. So therefor I have been order mine in an XL to have the extra length. I love the fringe detailing on your sweater! It looks so cozy, yet I love how you dressed it up with the statement necklace. Such a lovely look! The fringe on that sweater is gorgeous! Isn't it funny how quickly we can do photos when it's beyond cold outside? 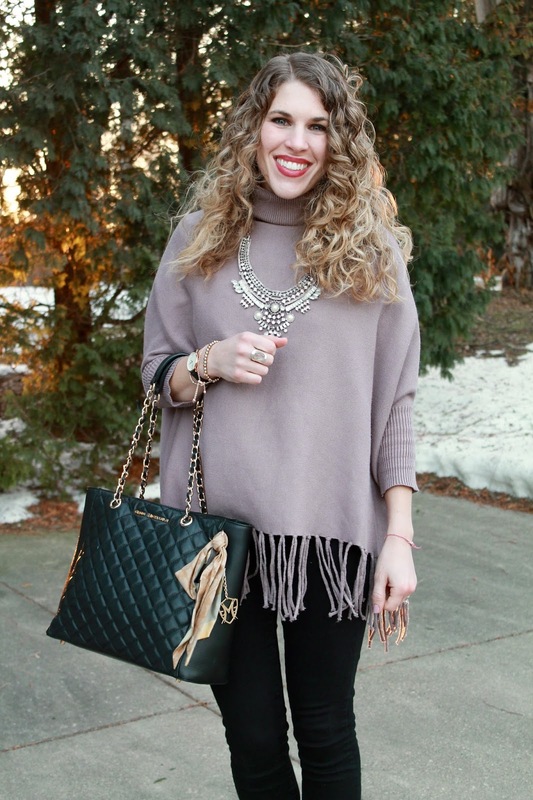 That sweater is lovely specially with the fringe and I can't believe your necklace is $5!! I can relate to freezing outfit photos! Glad you were able to get them done in no time at all, and I love the poncho, such a pretty color. I can't even tell you were cold because you look so comfortable! Your pictures look so good. Loving your hair!!! And this look is amazing...the fringe...the statement necklace...neutral colors. I love it all! Thanks for hosting, Laura! That necklace certainly does not look its price, what a find ! This is gorgeous! I love the fringe hem detailing! And that necklace makes such a statement! What a fun sweater, I love the fringe! And that necklace is gorgeous too--only $5?! Wow! This sweater looks so comfy and cute at the same time! Love this poncho! Your hair looks great, too! Beautiful sweater! The necklace looks lovely with it! I am loving the fringe detail! What a gorgeous outfit! Love the fringe detail on the sweater, and the necklace is stunning. So pretty! Love the sweater! I have the same necklace from Zaful and love it! Such a great outfit laura. and your hair is gorgeous! Beautiful look Laura! 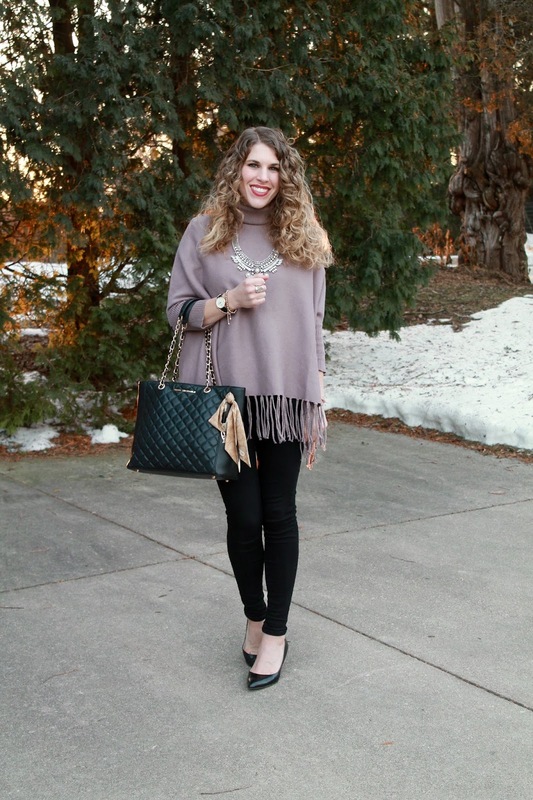 Love the fringe poncho and your necklace is gorgeous! The cape is so you! This is such a beautiful poncho! I love the color and the fringe detail! Your statement necklace was the perfect addition! Fabulous! this is such a cute casual look! thanks for linking up with The Weekly Style Edit!